Just when it was starting to look like the Halo franchise was played out, Bungie took it for a sharp turn, down an alleyway and directly into the shadows. 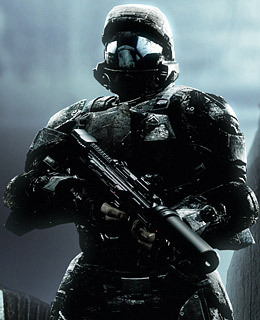 You no longer play the superpowered Master Chief; instead, you play, serially, the members of a squad of comparatively vulnerable Orbital Drop Shock Troopers. The squad is lost and scattered through the ruins of New Mombasa, on a secret mission the point of which its members are only gradually figuring out. It's a dark, slow, jazzy, hard-boiled take on the Halo world  think Master Chief as Philip Marlowe.